Professor Mark Cooper is Chair of Prediction Based Crop Improvement at The University of Queensland, and a global leader in quantitative genetics and plant breeding. His work involves integrating genomic prediction and crop growth models into an ‘end to end’ framework for crop improvement. Professor Cooper has pioneered the development of novel genetic modelling methodologies, based on gene networks, to study important properties of quantitative traits in biology, and demonstrated how this new genetic modelling framework can be successfully used in plant breeding to improve prediction of important traits under the influences of selection. Professor Cooper’s work at DuPont Pioneer on drought adaptation in one of the largest maize breeding programs in the world led to the AQUAmax hybrids that presently cover millions of hectares worldwide. 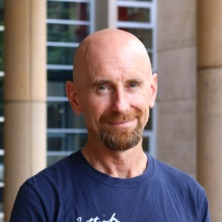 A quantitative geneticist by training, Professor Cooper spent 20 years working with industry in the United States and as CEO of his own consultancy firm Zenrun42, before returning to UQ to build upon the critical mass of predictive agricultural expertise in QAAFI and the wider university. (1999–2002) Pioneer Hi-Bred International Inc. The inheritance of grain yield among Veery wheat lines under Qld environ.conditions. Cooper, M., Podlich, D., Micallef, K. P., Smith, O. S., Jensen, N. M., Chapman, S. C. and Kruger, N. L. (2002). Complexity, quantitative traits and plant breeding: a role for simulation modelling in the genetic improvement of crops. In M. S. Kang (Ed. ), Quantitative Genetics, Genomics and Plant Breeding (pp. 143-166) Wallingford, UK: CAB International. Chapman, S.C., Hammer, G. L., Podlich, D. and Cooper, M. (2002). Linking biophysical and genetic models to integrate physiology, molecular biology and plant breeding. In M.S. Kang (Ed. ), Quantitative Genetics, Genomics and Plant Breeding 1 ed. (pp. 167-187) Wallingford, UK: CAB International. Eagles, H. A., Cooper, M., Shorter, R. and Fox, P. N. (2001). Using molecular information for decision support in wheat breedings. In R. J. Henry (Ed. ), Plant Genotyping: The DNA Fingerprinting of Plants (pp. 285-298) Wallingford, UK: CABI Publishing. Preface to Special Issue: Complex traits and plant breeding - can we understand the complexities of gene-to-phenotype relationships and use such knowledge to enhance plant breeding outcomes? Wang, JK, van Ginkel, M, Trethowan, R, Ye, GY, DeLacy, I, Podlich, D and Cooper, M (2004) Simulating the effects of dominance and epistasis on selection response in the CIMMYT wheat breeding program using QuCim. Crop Science, 44 6: 2006-2018.
Cooper, Mark, Chapman, Scott C., Podlich, Dean W. and Hammer, Graeme L. (2002) The GP problem: quantifying gene-to-phenotype relationships. Silico Biology, 2 151-164. How can breeding contribute to more productive and sustainable rainfed lowland rice systems? Mathews, Ky L., Trethowan, Richard, Milgate, Andrew, Payne, Thomas, van Ginkel, Maarten, Crossa, Jose, DeLacy, Ian H., Cooper, Mark and Chapman, Scott C. (2010). Indirect selection using reference genotype performance in a global spring wheat multi-environment trial. In: N. I. Dzyubenko, 8th International Wheat Conference: Abstracts of oral poster presentations. 8th International Wheat Conference, St Petersburg, Russia, (115-115). 1-4 June 2010. Chapman, S, Cooper, M, Podlich, D and Hammer, G (2003) Evaluating plant breeding strategies by simulating gene action and dryland environment effects. Agronomy Journal, 95 1: 99-113. Kruger, N., Cooper, M. and Podlich, D. (2002). Comparison of phenotypic, marker and marker-assisted selection strategies in an S1 family recurrent selection strategy. In: J. A. McComb, Plant breeding for the 11th millenium : proceedings of the 12th Australasian Plant Breeding Conference. 12th Australasian Plant Breeding Conference, Perth, Western Australia, (696-701). 15-20 September, 2002. Fukai, S. and Cooper, M. (2002). Field screening for adaptability in drought-prone rainfed lowland rice: ACAIR experience in Thailand and Laos. In: N.P. Saxena and J.C. O'Toole, Field Screening for Drought Tolerance in Crop Plants with Emphasis on Rice: Proceedings of an International Workshop on Field Screening for Drought Tolerance in Rice. Internl Wksp on Field Screening for Drought Tolerance in Rice, Patencheru, India, (61-62). 11-14 December, 2000. Susanto, D., Cooper, M., Carroll, B. J. and Godwin, I. D. (2002). Genetic diversity among the 13 wheat lines used to create base populations for yield improvement by recurrent selection in the Germplasm Enhancement Program. In: J. A. McComb, Plant breeding for the 11th millenium : proceedings of the 12th Australasian Plant Breeding Conference. 12th Australasian Plant Breeding Conference, Perth, Western Australia, (870-874). 15-20 September, 2002. Mathews, K. L., Chapman, S.C., Butler, D., Cooper, M., Delacy, I. H., Sheppard, J. A., Kelly, A. and Sahama, T. R. (2002). Inter-annual changes in genotypic and genotype by environment variance components for different stages of the Northern Wheat Improvement Program. In: J. A. McComb, Plant breeding for the 11th millenium : proceedings of the 12th Australasian Plant Breeding Conference. 12th Australasian Plant Breeding Conference, Perth, Western Australia, (650-654). 15-20 December, 2002. Chapman, S. C., Hammer, G. L., Podlich, D. and Cooper, M. (2002). Simulated influence of drought incidence on conventional and marker-assisted selection in sorghum breeding. In: J. A. McComb, Plant breeding for the 11th millenium : proceedings of the 12th Australasian Plant Breeding Conference. 12th Australasian Plant Breeding Conference, Perth, Western Australia, (468-473). 15-20 September, 2002. Pantuwan, G., Fukai, S., Cooper, M., Rajatasereekul, S. and O'Toole, J.C. (2002). Yield responses of rice (Oryza Sativa L.) genotypes to water deficit in rainfed lowlands. In: N.P. Saxena and J.C. O'Toole, Field Screening for Drought Tolerance in Crop Plants with Emphasis on Rice: Proceedings of an International Workshop on Field Screening for Drought Tolerance in Rice. Internl Wksh on Field Screening for Drought Tolerance in Rice, Patencheru, India, (54-58). 11-14 December, 2000. Fukai, S. and Cooper, M. (2001). Development of drought resistant cultivars for rainfed lowland rice-experience from northeast Thailand and surrounding area. In: The impact of Agricultural Research for Development in Southeast Asia. The Impact of Agricultural Research for Development in SE Asia, Phnom Penh, Cambodia, (185-194). 24-26 October 2000. Pantuwan, G., Fukai, S., Cooper, M., Rajatasereekul, S. and O'Toole, J.C. (2001). Field screening for drought resistance. In: S. Fukai and J. Basnayake, Increased Lowland Rice Production in the Mekong Region. Increased Lowland Rice Production in the Mekong Region, Vientiane, Laos, (69-77). 30 October - 2 November, 2000. Sibounheuang, V., Basnayake, J. W. M., Fukai, S. and Cooper, M. (2001). Genotypic variation in water protential at different positions and water conductance in rice. In: Proceedings of the 10th Australian Agronomy Conference. 10th Australian Agronomy Conference, Hobart, Tas, (1-6). 28 January - 1 February, 2001. Ouk, M., Fukai, S., Cooper, M. and Nesbitt, H.J. (2001). Influence of seedling time and seedling age at time of transplanting on the productivity of rainfed lowland rice with different level so fphotoperiod sensitivity. In: S. Fukai and J. Basnayake, Increased Lowland Rice Produciton in the Mekong Region. Increased Lowland Rice Production in the Mekong Region, Vientiane, Laos, (259-270). 30 October - 2 November, 2000. Sibounheuang, V., Basnayake, J. W. M., Fukai, S. and Cooper, M. (2001). Leaf-water potential as a drought resistance character in rice. In: S. Fukai and J. Basnayake, Increased Lowland Rice Production in the Mekong Region. Increased Lowland Rice Production in the Mekong Region, Vientiane, Laos, (86-95). 30 October - 2 November, 2000.
Cooper, M., Podlich, D. and Micallef, K. P. (2001). Modelling plant breeding programs: applications to forage crops. In: G. Spangenberg, Molecular Breeding of Forage Crops: Proceedings of the 2nd International Symposium, Molecular Breeding of Forage Crops. 2nd International Symposium, Molecular Breeding of Forage Crops, Lorne and Hamilton, Victoria, Australia, (67-82). 19-24 November 2000. Chapman, S.C., Hammer, G. L., Cooper, M., Podlich, D. and Borrell, A. (2001). The role of modelling in linking physiology, molecular biology and plant breeding. In: Borrell and Henzell, Fourth Australian Sorghum Conference. Fourth Australian Sorghum Conference, Kooralbyn, Queensland, (). 5-8 February, 2001. Chapman, S. C., Mathews, K. L., Cooper, M., Jensen, N. M., Wang, E., Butler, D. G., Sheppard, J. A. and Sahama, T. R. (2001). Using environment characterization to interpret wheat yield in water-limited environments. In: R. Eastwood, G. Hollamby, T. Rathjen and N. Gororo, 10th Assembly Proceedings, Wheat Breeding Society of Australia Inc.. Wheat Breeding Society fo Australian Inc. 10th Assembly, Mildura, Victoria, Australia, (136-139). 16-21 September, 2001. Fukai, S., Basnayake, J. W. M. and Cooper, M. (2000). Modeling water availability, crop growth, and yield of rainfed lowland rice genotypes in northeast Thailand. In: T.P. Tuong, S.P. Kam, L. Wade, S. Pandey, B. A. M. Bouiman and B. Hardy, Characterizing and Understanding Rainfed Environments. Characterizing and Understanding Rainfed Environments, Bali, Indonesia, (111-130). 5-9 December, 1999. Poppi, D. P., Jensen, N., Sheppard, J. A. and Cooper, M. (2000). The digestibility and some associated nutritional parameters of a new wheat cultivar (Seri 82-Aus) and barley (Gilbert) for sheep. In: G. Stone, Animal Production for a Consuming World. 9th Congress of Asian-Australasian Association of Animal Production Societies and 23rd Biennial conference of Australian Society of Animal Production, UNSW, Sydney, (219-221). 3-7 July, 2000. Qiao, C., DeLacy, I. H., Cooper, M. and Basford, K. E. (1999). Effect of check genotypes on the combined analysis of wheat breeding multi-environment trials. In: P. Williamson, P. Banks, I. Haak, J. Thompson and A. Campbell, Proceedings of the Ninth Assembly of the Wheat Breeding Society of Australia. Vision 2020, The Univ. of Southern Qld, Toowoomba, (227-229). 27 September - 1 October 1999.
Cooper, M., Podlich, D. and Jensen, N. (1999). Modelling breeding programs: Genes, phenotypes and breeding strategies. In: P. Williamson, P. Banks, I. Haak, J. Thompson and A. Campbell, Proceedings of the Ninth Assembly of the Wheat Breeding Society of Australia. Vision 2020, The Univ. of Southern Qld, Toowoomba, (121-128). 27 September - 1 October 1999.
Cooper, M., Godwin, I. D., Henzell, R. G., Jordan, D., McIntyre, C. L. and Tao, Y. Z. (1999). Pedigree analysis provides a useful adjunct to QTL analysis in sorghum. In: Proceedings of the 11th Australian Plant Breeding Conference. 11th Australian Plant Breeding Conference, Stamford Grand Hotel, Glenelg, SA, (222-223). 19-23 April 1999. Fukai, S. and Cooper, M. (1999). Plant breeding strategies for rainfed lowland rice in Northeast Thailand. In: T. Horie, S. Geng, T. Amano, T. Inamura and T. Shiraiwa, Proceedings of the World Food Security and Crop Production Technologies for Tomorrow. World Food Security and Crop Production Technologies for Tomorrow, Kyoto International Conference Hall, Kyoto, Japan, (153-156). 8-9 October, 1998. Qiao, C., Basford, K. E., Cooper, M., DeLacy, I. H., Phillips, I. G. and Matassa, V. J. (1999). Quantifying the effect of analytical methods on estimates of heritability from wheat multi-environment trials. In: Biometrics 99, Program and Abstracts. Biometrics 99, Univ. of Tas., Hobart, Tas, Aust., (23). 12-16 December 1999. Gororo, N. N., Eagles, H. A., Ogbonnaya, F. C., Eastwood, R. F., Podlich, D., Cooper, M. and Howes, N. (1999). Strategies for the efficient utilisation of molecular markers. In: P. Williamson, P. Banks, I. Haak, J. Thompson and A. Campbell, Proceedings of the Ninth Assembly of the Wheat Breeding Society of Australia. Vision 2020, The Univ. of Southern Qld, Toowoomba, (132-133). 27 September - 1 October 1999. Jensen, N., DeLacy, I. H., Cooper, M., McLaren, C. G. and Fox, P. N. (1999). The ICIS solution to pedigree and data management in the germplasm enhancement program. In: P. Williamson, P. Banks, I. Haak, J. Thompson and A. Campbell, Proceedings of the Ninth Assembly of the Wheat Breeding Society of Australia. Vision 2020, The Univ. of Southern Qld, Toowoomba, (101-105). 27 September - 1 October 1999. Jensen, N., Podlich, D. and Cooper, M. (1999). The influence of crossing strategy on genetic progress from pedigree breeding. In: P. Langridge, A. Barr, G. Auricht, G. Collins, A. Granger, D. Handford and J. Paull, Proceedings of the 11th Australian Plant Breeding Conference. 11th Australian Plant Breeding Conference, Stamford Grand Hotel, Glenelg, SA, (83-84). 19-23 April 1999. Chapman, S. C., Hammer, G. L. and Cooper, M. (1999). Using crop simulation models to examine genotype by environment interaction in variable water-limited environments. In: P. Langridge, A. Barr, G. Auricht, G. Collins, A. Granger, D. Handford and J. Paull, Proceedings of the 11th Australian Plant Breeding Conference. 11th Australian Plant Breeding Conference, Stamford Grand Hotel, Glenelg, SA, (135-136). 19-23 April 1999. Sheppard, J. A., DeLacy, I. H., Butler, D. G., Ratnasiri, W. G., Ellison, F. W., Brennan, P. S. and Cooper, M. (1999). Wheat multi-environment testing in the GRDC Northern Region. I. Grain yield database. In: P. Williamson, P. Banks, I. Haak, J. Thompson and A. Campbell, Proceedings of the Ninth Assembly of the Wheat Breeding Society of Australia. Vision 2020, The Univ. of Southern Qld, Toowoomba, Qld, (187-189). 27 September - 1 October 1999. Sheppard, J. A., DeLacy, I. H., Butler, D. G., Ratnasiri, W. G., Ellison, F. W., Brennan, P. S. and Cooper, M. (1999). Wheat multi-environment testing in the GRDC Northern Region. II. Genotype-by-environment interactions. In: P. Williamson, P. Banks, I. Haak, J. Thompson and A. Campbell, Proceedings of the Ninth Assembly of the Wheat Breeding Society of Australia. Vision 2020, The Univ. of Southern Qld, Toowoomba, Qld, (190-193). 27 September - 1 October 1999. Wegener, M. K., Sheppard, J. A., DeLacy, I. H., Butler, D. G., Ratnasiri, W. G., Ellison, F. W., Brennan, P. S. and Cooper, M. (1999). Wheat multi-environment testing in the GRDC Northern Region. III. An analysis of trial costs in Central and Southern Queensland. In: P. Williamson, P. Banks, I. Haak, J. Thompson and A. Campbell, Proceedings of the Ninth Assembly of the Wheat Breeding Society of Australia. Vision 2020, The Univ. of Southern Qld., Toowoomba, Qld., (194-196). 27 Sept - 1 Oct, 1999. Sheppard, J. A., DeLacy, I. H., Butler, D. G., Ratnasiri, W. G., Ellison, F. W., Brennan, P. S. and Cooper, M. (1999). Wheat multi-environment testing in the GRDC Northern Region. IV. Geographical zoning. In: P. Williamson, P. Banks, I. Haak, J. Thompson and A. Campbell, Proceedings of the Ninth Assembly of the Wheat Breeding Society of Australia. Vision 2020, The Univ. of Southern Qld, Toowoomba, Qld, (197-199). 27 September - 1 October 1999. Wegener, M. K., Sheppard, J. A., DeLacy, I. H., Butler, D. G., Ratnasiri, W. G., Ellison, F. W., Brennan, P. S. and Cooper, M. (1999). Wheat multi-environment testing in the GRDC Northern Region. V. Optimum number of regional trials for cultivar selection. In: P. Williamson, P. Banks, I. Haak, J. Thompson and A. Campbell, Proceedings of the Ninth Assembly of the Wheat Breeding Society of Australia. Vision 2020, The Univ. of Southern Qld., Toowoomba, Qld., (200-203). 27 Sept - 1 Oct 1999. Selection to accomodate genotype-by-environment interactions in the Northern Wheat Improvement Program. The crop improvement of grain sorghum in Australia - Improving transpiration efficiency in sorghum. Overcoming production constraints to sorghum in rainfed environments in India and Australia. Plant breeding strategies for rainfed lowland rice in Northeast Thailand and Laos. To attend, present papers and participate in the 8th Australian Wheat Breed Assembly to be held in Canberra in 1996 - for several people. Technical Assistance Grant-MRC Junior Research Fellowship-Mr.Zulfi Jahufer.